Here at Farlight, we stock a range of energy saving LED aircraft/aviation warning lights, obstruction lights and controllers. The Farlight L864/865LED is the most rugged and efficient medium intensity LED obstruction light on the market. 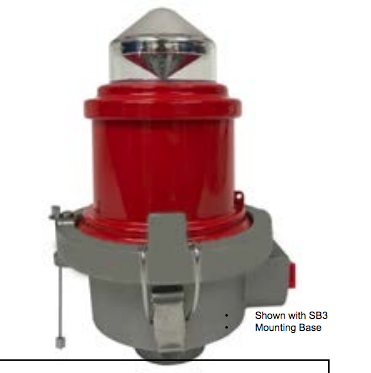 The L864 is the smallest, lightest, and most efficient medium-intensity flashing red obstruction beacon on the market. The L810 is a highly efficient and reliable replacement for incandescent L-810 obstruction lights. Available with retrofit, single or double mounting kits. The latest and most advanced controller on the market, the NV-1000 has been designed to reliably sense the proper operation of the latest low-power LED obstruction lights. The latest and most advanced controller on the market, the NV-1200 has been designed to reliably sense the proper operation of the latest low-power LED obstruction lights, with an array of dry alarm contacts to report on all aspects of system health. For further information on any of the products above, or to place a product order, give us a call on 1 800 327 544 or send us an online enquiry.